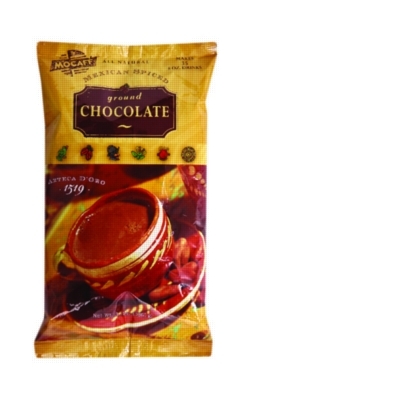 Laced with fragrant spices such as cocoa liquor, real vanilla, almond, and cinnamon, Azteca D�Oro Mexican Spiced is the most delicious ground chocolate found anywhere. Use MoCafe Azteca D�Oro Mexican Spiced Chocolate to make delicious hot cocoas, blend it up to create decadent mocha frappes or create unique mochas by adding a shot of espresso. Sold in a 3 lb. bag. Contains tree nut and soy ingredients. INGREDIENTS: Pure Hawaiian cane sugar, Premium African Forestero cocoa, ground chocolate (sugar, cocoa processed with alkali, unsweetened chocolate, soy lecithin,pure vanilla) spices, all natural almond flavor and salt.